A female Ukrainian citizen has been extradited from Montenegro to Ukraine. She was wanted by the National Anti-Corruption Bureau (NABU) for committing fictitious entrepreneurship and legalizing proceeds from crime to a total amount of more than UAH 1.6 billion. "Thanks to the joint efforts of Ukraine's Prosecutor General's Office (PGO) and NABU, the Ministry of Justice of Montenegro in September 2018 decided to extradite this person to Ukraine. 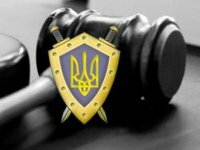 On October 18, 2018, the citizen was accepted by Ukrainian law enforcement officers and handed over to NABU detectives," PGO's Department of International Legal Cooperation said on Thursday. The information does not provide the name and surname of the extradited Ukrainian citizen. The Kyiv-based Ukrayinska Pravda ezine, citing spokeswoman for the Prosecutor General Larysa Sarhan, said Montenegro extradited to Ukraine Iryna Musiyenko, who was detained in Montenegro in April 2017. She is suspected of involvement in the so-called "gas scheme" along with fugitive parliament deputy Oleksandr Onyshchenko.